Normally I would not draw attention to anything in The New Statesman because it does not tell the truth. Stephen Bush is a liar. 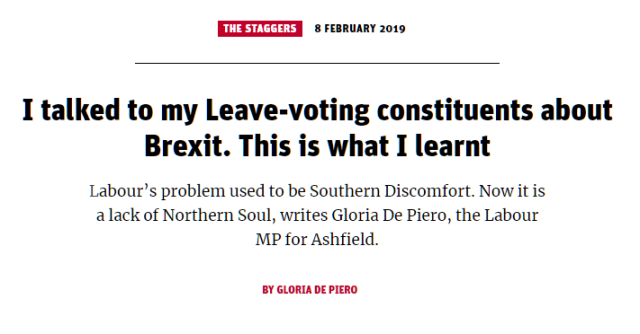 Today though, it features an article from Gloria De Piero MP. It's the usual safari shtick - "we must listen to abandoned northern poor people" before telling us "The truth is that none of these problems were created by membership of the EU and nor will they be solved by leaving". So the mindset is still the same. We think the plebs are wrong but we have to at least look like we care. What struck me was one of her anecdotes. Paige also left school at 15 with no qualifications. She was diagnosed with mild autism but felt she didn’t get the support she needed to finish school. She dreams of becoming a midwife but says the education system is too rigid to allow her to learn at her own pace and would mean running up debts she couldn’t afford. “You could easily just go in and observe and learn it first-hand instead of having to go to college and university. Obviously you are handling life so it’s a big job but what happened to experiencing it first-hand. You learn more first-hand than what you do on paper,” she said. Barbara also brought up the fact you have to study for a nursing degree nowadays rather than being taken on as a trainee by a hospital as an obstacle to people going into nursing. Tony believes it is harder now to work your way up from the bottom and there is too much emphasis on going to university. What is described here is a relatively new dynamic. It started in the early nineties. I was probably the last generation who could fall out of school and into the local factory and acquire a trade. I seriously don't envy youngsters trying to find their way off the bottom rung now. Most opportunities now are closed off unless you meet a whole heap of prerequisites which present a huge barrier for anyone with domestic commitments and financial constraints. If you want to do a useless degree course you'll have banks throwing money at you but if you want skills training, you either have to rely on community colleges where the teaching is poor or save up for private sector training. It's now rare that businesses will take people on and train them. My own career as a software developer was thanks to two courses at a private training facility in Leeds. Two week intensive courses are better than a year of college where what they teach is often useless and obsolete. This cost £1500 which was a lot of money at the time. It was the best money I ever spent and that skillset is worth more to me than a degree and the lack of a degree is no obstacle in the IT field. Being that I have a reasonably accomplished CV I always have a fallback trade, but starting in any other field would now require an investment in one or other qualification. There's not a cat in hells chance of finding an employer who will pay for it and there is virtually no support for living costs while you train. I know a guy who did manage a software engineering HND but only by lying to the dole office. The last thing you tell them is that you are independently trying to re-skill. The system doesn't tolerate it. There are three central reasons why it's harder than it was. De Piero makes mention of downward pressure on skilled trade. Economists such as Jonathan Portes continue to publicly lie about this and remainers lap it up. It's not just for brickies though. It has a noticeable effect in things like software engineering where the breadth of skills now demanded increases while the wages stagnate. Being that recruitment is now done by way of outsourced agents, it's all done by keyword matching and since they can fish from a far wider pond, they have no incentive to train. Why take an estate kid when you can bring someone over from Poland? I've seen this dynamic in every sector from computing to nuclear engineering. This hooks in with the second issue; the way we do business. For all that we have notionally privatised the economy, a vast chunk of the private sector economy is servicing government procurement be it Trident renewal, Hinkley Point or some other big ticket "investment". Much of the work has to be fed into the OJEU system for EU wide bidding and generally contracts are only really obtainable by the big consultancy firms. Often they have no in house capability to fulfil the contract but they have the gargantuan bureaucracy to meet all of the requirements for a successful bid, be it eco-compliance and all the necessary kite marks etc. Only if they win the contract will they crew it up on a Just In Time basis. So there is no permanent pool of skills and being that it is on a JIT basis, there isn't the time to train up new staff. This is why the design offices at Airbus are full of people from Poland and Indonesia. There was a time when most people working at Airbus Filton would have been brought up within sight of the factory. Here business will often complain of a skill shortage but they are willing to do nothing to remedy it save to lobby for more visas for Indian workers whom they can more readily exploit. This might then explain why here in Filton we voted to leave. Airbus can threaten to bugger off but they're not hiring locally anyway. This, though, is not a whinge about immigration, rather it is to do with the culture of tendering and procurement which favours global multinationals and the consultancies who already enjoy preferred bidder status. This is as much to do with the layers of bureaucracy you have to go through just to put in a bid. Small firms in business parks in Gloucestershire have to spend tens of thousands on pointless annual environmental impact assessments if they want to put in a bid. One wouldn't be surprised if the monopoly firms actually lobbied for them to freeze out competition. As much as this is true of engineering it is also true of healthcare and hospitals have major compliance bureaucracy which increasingly makes demands on the levels of qualification for staff. Again this sees the NHS casting their recruitment net abroad which is why the left is always keen to remind us that migrants prop up the NHS. Very often you won't see a British dentist. If there are British working class people to be found anywhere, they tend to be the admin staff. What we have is an ossified and risk averse system which is very much to do with the culture of governance which is everything to do with the EU in the way it regulates for European homogeneity. It disproportionately affects the UK because the UK does actually implement EU measures in ways the French find ways around. This is what leads to qualification inflation and an unnecessarily high bar of entry to many of the trades. That many roles are now degree technician grade is not coincidental and is partly why the NHS has massive wage overheads. If you wanted a system to exclude the plebs it would look a lot like EU governance. Then, of course, there's those precious "EU workers rights" which are actually nothing to do with mine or your protection, rather they are again measures to enforce homogeneity between member states. In every respect the EU makes it worse for workers. EU rules upset a delicate balance between employer and employee, once fiercely policed by unions. Now, though, unions are compliant parts of the machines. The layers of protections demanded by the EU resulted in the unintended consequences of destroying permanent jobs - which then resulted in the corrective Agency Workers Directive which totally destroyed labour market fluidity. Not for nothing are people increasingly "self employed contractors". This is one of the main reasons I hate the EU with a passion. Of course, it can be argued that not all of this is the result of EU legislation and much of it is a consequence of globalisation and automation - and certainly our own government makes a number of wholly useless interventions and so it is increasingly difficult to tell what can actually be blames on the EU. But then that's the ambiguity the EU enjoys as it allows them to duck responsibility. The one instance where there was a clear line of accountability was with the posted workers directive which caused a great deal of damage - which took more than seven years to reform, still isn't fixed and never will be. What we have built since about 1996 is a vast regulatory construct which is there largely for the convenience of capital. It disempowers workers and demotes them to the status of organic components. It neuters unions and robs people of their sovereignty over the labour and market laws. What Britain needs is a radical overhaul of its culture of governance and and to put the power over things like workers right back in the hands of the people. For as long as it is locked up in the treaties of the EU, any UK reform can only really be tinkering around the edges. I then get heartily sick of the likes of De Piero and Lucas blithely telling us that it's time to listen and that we need to address the needs of working class people while doing everything in their power to ensure we stay tethered to the EU without the necessary powers to rebuild our own society. We hear MPs mouthing the platitudes of reform but what people need is a real say in how they are governed. Every power the EU has over our rights and our laws is a power we do not have. It doesn't matter how many poverty safaris our MPs set out on. Unless they do as instructed (ie leaving the EU) respecting the essence of that mandate, they cannot honestly claim to be listening. My preference is that the UK leaves with a deal but it increasingly looks like MPs like De Piero are moving to ensure the people's sovereignty is constrained in any new deal, be it non-regression clauses and the customs union. They seek to deprive us over our democratic ability to decide for ourselves the basis upon which we trade with others and our means to influence our laws. Brexit really won't "solve anything" if MPs are resolved not to take back control and leave our laws exactly as they are. De Piero expects a pat on the head for talking to her constituents but she isn't listening nor is she thinking. Brexit is a once in a generation chance to completely rethink how we do things but she and her co-conspirators are working to ensure we are robbed of that chance. It comes as no surprise that Brexiters now prefer no deal at all. It comes down to the simple fact that our so-called representatives cannot be trusted not to betray us at the first opportunity.